The Jerome B. Wheeler Building, formerly the Wheeler Bank, at 717-719 Manitou Avenue, was built in 1888-1889. When Jerome B. Wheeler, one of Colorado’s great financiers and mining barons, decided to open Manitou Springs’ first bank, he hired contractor MacFarlane & Co. to construct the detached, three-story Romanesque design of architect J.L. Nichols. When it first opened, the bank shared the ground floor with a dry gods store and nine offices on the second floor, all with running water. One early tenant was African-American boxer George Philip’s school for physical culture. The third floor, with its fifteen-foot ceilings, housed the town’s first true opera house, Wheeler Hall, which held minor dramatics and balls. During the 1893 Silver Panic, The Wheeler Banking Company defaulted, as did many financial institutions. After 1900, the building was converted into a small hotel and was known as the Nyoda and then the El Parque. After serving as apartments for many years, new owners restored and preserved its historic character in 1975. 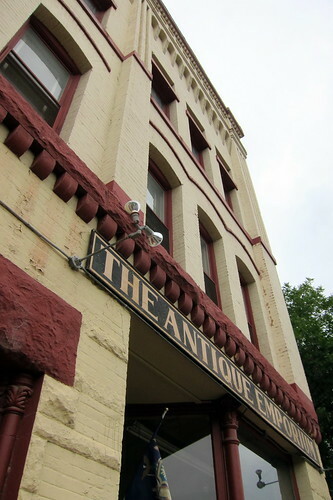 Today, it houses the Antique Emporium and Swirl Wine Bar. This entry was posted in Colorado and tagged bank, Building, Colorado, Manitou, Springs, Wheeler. Bookmark the permalink.